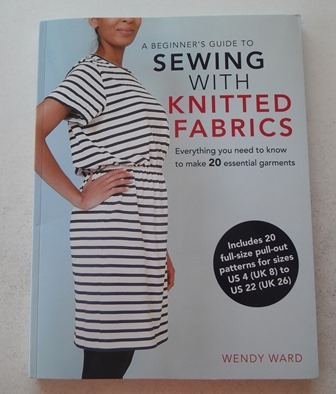 As I was going through all the patterns in A Beginner’s Guide To Sewing Knitted Fabrics there was one pattern that kept doing my head in every time that I looked at it, the Longshaw Skirt. I just couldn’t get my head around how it was constructed from looking at the drawing of the pattern pieces no matter how many times I looked at it or tried to read through the instructions. The front and back of the skirt are the same pattern piece so you cut 2 of the same but the piece had lots of curves to it and I couldn’t work out where the seam lines went or which was the top and bottom. 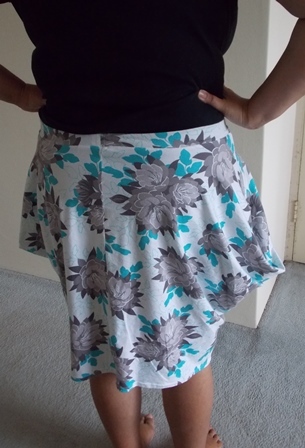 I trust Wendy Ward’s pattern so I figured she knew what she was doing with making this skirt, after finding some white printed fabric in my stash that I got from Zebra fabrics and not knowing what else I might do with it I dived in and tried this pattern. Once I had the skirt pattern pieces cut out the instructions started to become more clear in my head. This skirt has a centre front and centre back seam rather than side seams and a curved bottom hem line. 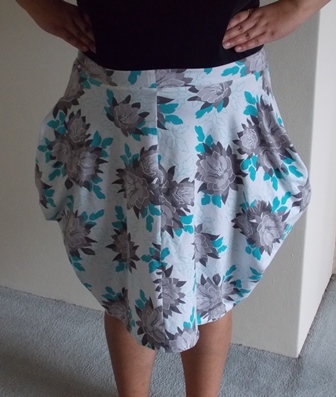 I have nicknamed this my origami skirt due to way you fold the pocket pieces in on the sides. It is actually very cleverly constructed once your brain grasps the concept of it. This skirt is actually really comfortable, the hem line of the skirt does come in a bit so it doesn’t flare out at the bottom but it isn’t restrictive. This is a very quirky skirt, as I mentioned above it is a bit of a brain twister. The knit fabric I used is a light weight cotton and is very soft and comfortable. I don’t think I would really call it a classic style unless a tulip style is considered a classic style of skirt. Now I will be perfectly honest I’m not entirely convinced that I like this skirt although I have worn it multiple times to work because the pockets are amazing. Saying that as wonderful as the pockets are I think they make me look too side heavy/bulky/puffy. I don’t have that large of thighs but with the pockets flaring out right on the thigh area I just think it looks bulky. I’m not sure if in black fabric it would make it seem less wide. Would I make this skirt again? I’m curious now how it would look in black. I do now have some black brush cotton in my stash which is a heavier knit that I might try another with but with it being a heavier knit it might not drape as well and will that result in the same bulky thigh feeling. I’ll think about it. It was good to try out this pattern and tick it off my list of patterns from the book. I used fabric from my stash too so that is always a good thing.